Governments worldwide are embarking on journeys to make their cities ‘smart’ and connected, providing citizens and residents with modern conveniences such as seamless transportation and powerful Internet connectivity speeds enabled through well-planned and implemented infrastructure. More often than not, a city’s infrastructure is rather ‘unseen’ and invisible – taken for granted until something goes wrong or causes great inconvenience for the end user. The reality is that a well-planned and developed Smart City requires extensive research and consultation on laying the infrastructure groundwork. Fortunately, the rapid progress of technologies and computing power has allowed for software simulations, projections, and prediction of Smart Cities even before they are built. OpenGov spent some time with Mr. Greg Bentley (above photo), CEO of Bentley Systems, an American-based software development company that develops, manufactures, licenses, sells and supports computer software and services for the design, construction, and operation of infrastructure. 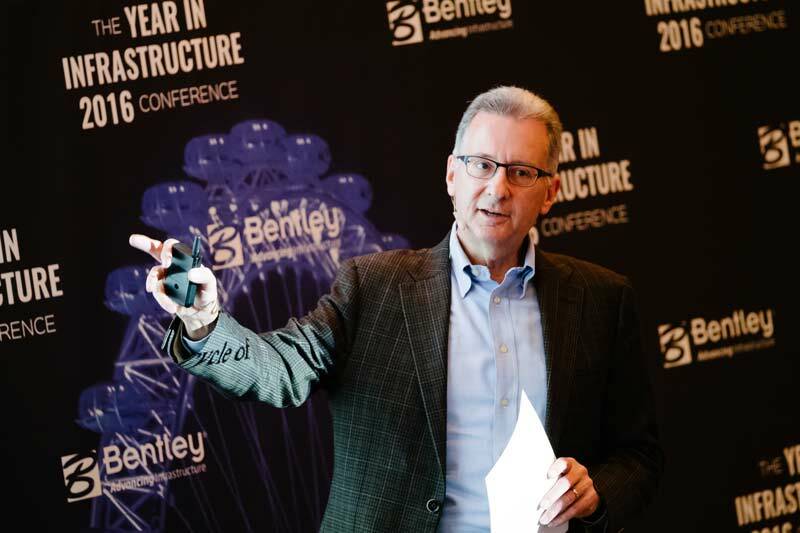 In this interview, Mr. Bentley shares his thoughts on the trends and challenges in infrastructure innovation, developments in Building Information Modelling (BIM) software and more. There’s much talk about smart cities around the world today. What would you identify as essential characteristics of infrastructure in a smart city? I think that the ‘smartness’ refers to connections and we say, ‘going digital’, the way we describe getting smarter in our cities and in our infrastructure. It’s about having the engineers’ computer programmes talk to each other during the operation of the city, that’s the smartness. The smartness isn’t being able to be seen by people, it’s to have one computer programme see the result of another computer programme, that’s the ‘digital’. Could you tell us about some current trends in infrastructure innovation? What are the biggest challenges? In the world, there is a big infrastructure gap between what we have and what we need, the question is how we would pay for filling the gap. One answer is we can be more productive, and the productivity in infrastructure projects has been unfortunately flat, compared to the improvements in the rest of the economy. We can help by closing that gap in going digital, but when you asked about the biggest trend in the world for infrastructure—there are now enough private investors who would want to invest in infrastructure, to fund closing this gap. There are enough projects to use all that money, but the problem is that infrastructure projects too often are not bankable, meaning they are not predictable enough. And the worst and best projects have this big variance in performance that often prevents investors from having confidence in investing in them. So, going digital should help to make the projects bankable and repeatable. For example, when oil was 100USD a barrel, inefficiencies in capital projects to deliver oil were less scrutinized. But now, projects are not going to occur unless they are much more efficient. And it turns out that the worst inefficiencies were at the construction work face itself, where people doing the industrial construction can only spend 37% of their time using tools on work. During the rest of the time, they’re waiting and watching for the right materials to be there or for someone to get out of their way so they can work. While they are on site, they are subject to accidents, and so forth. They are actually productive 37% of the time. But the good news is we can advance. There is a lot of headroom to make things efficient. So, one of the things that oil companies are focusing on is taking the simulation level for their CAPEX projects from their BIM designs in 3D or sometimes 4D and modularising what they build. Modularisation and fabrication can improve productivity by manufacturing modules off site. Then we need the 3D simulations to become 4D simulations in time to show how the modules are going to come together and where the connections are going to be. The next level is for the actual crew at the work face. What are they going to be working on at any given time? Where is the material going to come from? Modelling down to the level of every task, for every crew, for every day—that is the process called advanced work packaging. We have engineering work packages, construction work packages and installation work packages, and where this is being used in the world, there is a higher level (up to 60%) of time on tools which can reduce the cost. Most importantly, it gives visibility into the path of construction, helps reduce variance and enables action before the project goes off-course. So, simulation to the level of the work face plan is a way of helping projects become bankable in their construction stage, and I’m recommending that now for Singapore where you have projects like the big water plant in Tuas. When we utilise the BIM models in operations, I call that leveraging the digital DNA. Industrialising BIM during project delivery and leveraging digital DNA during maintenance and operations—that’s going digital for infrastructure engineering. Another trend is that public-private partnership (P3) projects are increasing and are especially increasing in Asia. The Finance Minister of Singapore mentioned that Singapore is counting on some P3 projects. These lessons can be learned, and we hope that government agencies will use these strategies to close the advancement gap on publicly-funded projects. How have BIM systems evolved in recent years with developments in ICT in areas such as big data, cloud computing, IoT etc.? All of our engineering users now are connected through cloud services. Engineers still work on desktop applications because their data is so large, and the granularity of their work is such that they don’t want to be sending their every key stroke. The computing is in their desktop, but the Internet connects them together. It gives them access to additional computing, for instance, to process reality models for digital photographs and for optioneering to explore more design alternatives. So, I would like to make an observation for you – given Singapore’s world leading connectivity and digital infrastructure, it’s very surprising to visit government agencies in Singapore and learn that they have been isolated from the Internet. And as a result, BIM deliverables from their consultants and contractors in the supply chain are exchanged on DVDs and USB drives. Perhaps that will be temporary, and it will be perfectly fine for there to be a government private cloud. But today, in these public agencies, users are getting our emails and sending us emails from their cell phones. And some of them are not even allowed to do that. In that regard, I say cybersecurity is even more important than ever because the value of being connected is some of what I’ve been describing. If we can’t accomplish these things without cloud services, then making the cloud a safe environment from cyberthreats is all the more valuable. I think that means the smart technologies will all go to work on that problem, and I have confidence that the result will be staying ahead of the threats. This is important to Singapore so that that this Smart City can take full advantage of the work of connected engineers, and connected digital engineering models, going digital through industrialising BIM, and leveraging digital DNA. BIM (Building Information Modelling) is an intelligent 3D model-based process that gives architecture, engineering, and construction (AEC) professionals the insight and tools to more efficiently plan, design, construct, and manage buildings and infrastructure.